Now if you remember back when the iPad was being introduced in the Steve Jobs keynote a few months ago, he mentioned that the device is unlocked and you can use any carrier (that uses gsm) with the iPad. Well I though we should put that to the test, the only problem is that the iPad uses Micro-Sim cards rather then the standard Sim Card. Well thanks to my awesome brain (my awesome brain = google) you can make your T-Mobile iPad dreams come to life! Before you even waste your time reading how to do it, lets settle a few things before. There are two positives towards doing this, one you actually have service and two you are paying less for data with no cap. Now there is a negative…which is a huge negative and will probably pull most of you away from doing this, you can only use edge, the iPad doesn’t support the same 3G frequency that T-Mobile uses. 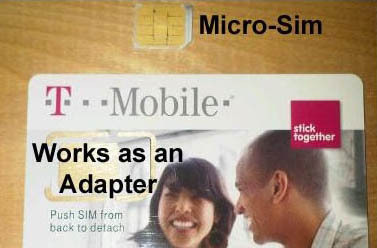 Now this is pretty straight forward, simply buy a T-Mobile microsim then activate it (Click me for an Amazon link). In all honesty, you’re better off going with Option 1 if you’re using T-mobile, however if you’re in another country or in an area where there are other GSM providers who don’t have Micro-Sims, this is really nice to use since it’s so precise. If you look at the image below, all you do is pop your sim in, press the tool, and a MicroSim pops out. If you have no other options (or if you’re incredibly cheap like me), then this is one thing you can do. Use the AT&T Microsim that comes with the iPad as a template, then simply cut with scissors. Make sure you don’t cut any of the gold and you should be fine!